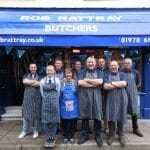 Today Rob Rattray celebrated 25 years in business. Thanks to all the loyal customers who have supported us over the years. We very much appreciated your loyalty and know many customers have been loyal throughout the entire period.